Why limit yourself? Gas fuelled units aren’t strictly for basic household appliances, there are several other applications you may want to consider. Fireplaces, inside or out, are an excellent addition to any space. Plus, make the most of the precious patio weather days we get in the lower mainland by considering the extra possibilities that those outdoor natural gas appliances can bring to your outdoor space. As with their interior counterparts, outside gas appliances offer lasting added value to your home. 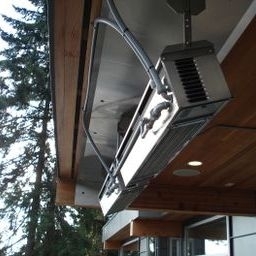 Patio Heaters – Enjoy your patio year round with radiant outdoor patio heaters. Whether it’s for your commercial property or your home, R&B has the experience for this type of installation. Visit our gallery to look at a few that we’ve installed. Barbecues – As in Constant Feed Natural Gas Barbecue Boxes. Tired of propane? Refilling bottles or purchasing little canisters can get tiresome. That is why more homeowners like to have the convenience of natural gas barbeques that feed directly from the house gas line. This type of fuel is just as capable and cost effective as propane without the need for carrying the fuel home yourself. While energy efficiencies for fireplaces are still quite low by our current home heating standards, they make a lovely addition to the atmosphere of any room even outdoors. Whatever your outdoor gas needs or dreams are, look to R&B for a free in-home estimate.